High Quality Content by WIKIPEDIA articles! 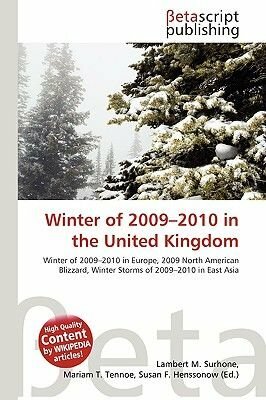 The winter of 2009-2010 in the United Kingdom (also called The Big Freeze by British media) was a meteorological event that started on 16 December 2009, as part of the severe winter weather in Europe. It lasted approximately 4 weeks. A persistent pattern of cold northerly and easterly winds brought cold moist air to the United Kingdom with many snow showers, fronts and polar lows bringing snowy weather with it. The winter weather brought widespread transport disruption, school closures, power failures, caused sporting events to be postponed and 25 deaths. In northern England, 57 centimetres (22 in) of snow was recorded; 47 centimetres (19 in) was recorded in Aviemore, and about 60 centimetres (24 in) was recorded within the Cairngorms National Park. A low of 22.3 C (8.1 F) was recorded in Altnaharra on 8 January 2010.